Oak Hills Park, in June. NORWALK, Conn. – The Oak Hills Park Authority has worked out a deal to restructure its loan agreement with the City. “We have crafted something that would allow Oak Hills to move forward and not have to come back to the City while recognizing the fact that a lot of the issues creating the current situation were issues that happened 15-18 years ago, and it really was a difficult situation for them to continue to operate under those conditions,” Mayor Harry Rilling said at Monday’s Board of Estimate and Taxation (BET) meeting. The BET went on to unanimously approve the restructuring – which replaces yearly loan payments by the Authority with a percentage of its intake, and lowers the interest rate to zero. The arrangement also authorizes a $83,000 “reimbursement” to the Authority for its expenses in upgrading restaurant equipment. The loan restructuring will now go to the Common Council for approval. Council President Tom Livingston (D-District E) and Finance Committee Chairman Greg Burnett (D-At Large) helped craft the deal, through consultation with Council members via emails and phone calls, Rilling said, so he expects that it will be approved. The Authority has long attributed its financial problems to the payments on a $2.2 million loan from the City issued in 2005 to fund improvements at the park, the construction of the restaurant building and cart paths. The debt has been restructured three times. A restructuring in 2015 reduced payments from $290,000 to $160,000; payments dropped again when the loan was restructured to include the “irrigation that had 10 years remaining,” former OHPA member Joe Tamburri said in September. “The Authority has a balance of just under $2 million to pay,” then-OHPA Chairman Jerry Crowley said in 2017. The Authority made only the interest portion of its payment in September 2017, paying $52,000 instead of $131,000, and has not made any payments since. Construction on the course, funded by a $1.5 million state grant, lowered golf course revenue three years ago as the course was down to nine holes and it was noisy, then there were two years of bad weather, Controller Mark Gartner said Monday. “We went from almost 40,000 rounds to this year we had 34,000-35,000 rounds. So, our cash inflows were heavily reduced… it’s kind of a storm of just constantly decreasing revenues while increasing outflow,” he said. The Authority evicted restauranteurs Amar Haouri and Vincent LaForte a year ago. Their new tenant was not paying rent, OHPA Chairman Bill Waters said in June. A new lease has been negotiated with that same tenant, to pay $4,000 a month from July to the end of the season, and then either a Request for Proposals will be issued or the current tenant, if doing well, will negotiate based on his intake, Waters said Monday. The Authority spent $93,000 on new equipment for the restaurant. The BET approved a resolution to repay the Authority $83,000, based on the Authority’s cash flow needs, as described by Gartner. The Authority “will be completely tapped out” on its $200,000 line of credit by Friday, Gartner said. The BET’s $83,000 appropriation will get it through the winter. The revolving line of credit can be renewed by the Authority in November if it’s been paid in full for at least 30 days. If the Common Council approves the new deal, the Authority would make monthly payments on its loan, equal to $2 per round of golf. This payment would go up by five cents per round in every fiscal year afterwards. Payments would not begin until July 1, 2020. In addition, the Authority would make an annual payment of 1 percent of its audited annual gross golf revenue, but would not be required to use its line of credit to do so. The interest rate would be dropped to zero, retroactive to Fiscal Year 17. BET member Troy Jellerette asked why the payments would begin next year. Burnett, sitting in the audience, answered that thinking shifted from an initial idea to have the Authority start making minimal payments when it paid off its line of credit. BET member James Frayer peppered Waters and Gartner with questions, asking what happens if the number of rounds doesn’t increase, and instead continues to drop. He chuckled when Frayer mentioned climate change, and Frayer asked what would happen to the agreement if rounds declined. Some expenses are tied to the amount of play, so that would mitigate the issue somewhat, but it’s possible that it might take longer to pay off the loan, he said. A potential deal with the Authority was first reported by NancyOnNorwalk in June. The proposal was not on the agenda for Monday’s BET meeting. What a scam! What is 100% of nothing? That’s right! Zero! That’s what the Taxpayers will get. Turn Oakhill into a park and call it a day. I do some work at Oak Hills and I play golf there and from what I have been hearing the park authority is the one who drove the discussions. They do not get the credit they deserve. I applaud them for sticking to their guns and getting a better deal. The course is beautiful and the park offers more than ever before. If the city never built that building Oak Hills would be in much better shape. @ Roger, Let’s get the facts straight at one point this building for years was generating over 100k a year rent for the course. This Authority who you praise decided to take over a good portion for a golf shop that was not needed and now how much do they collect in rent 0 because of the smaller size. Our family and friends had many private functions their through the years and even my high school had our 50th reunion at Oak Hills all while mingling in with golfers. Roger it’s not the building it’s the people you work for that caused this dilemma! @Sandra, the problem is the building needed to generate $300k a year to be economically worthy of constructing it in the first place. The course is in great shape in spite of this financial albatross. This restructuring is a long time overdue. The mindset that this should not have any support would also have us close all the beaches and parks city wide. Is that who we want to be? 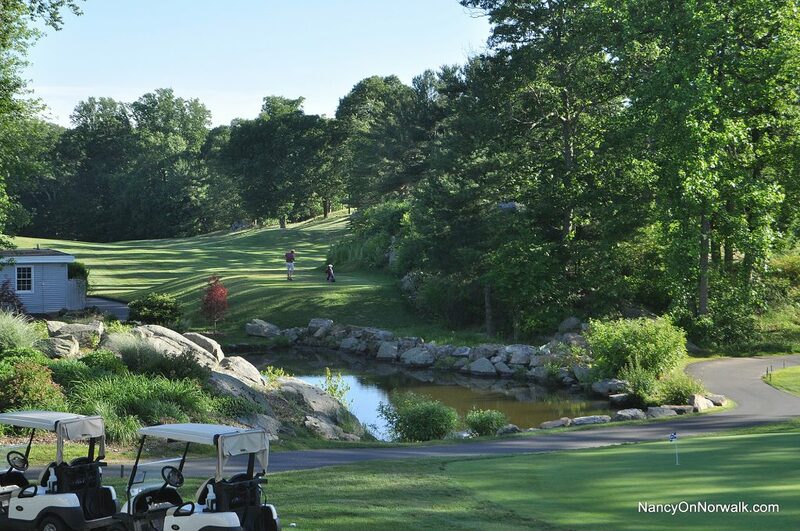 Lets have more “restructurings” to help subsidize Golfers from Norwalk and surrounding Towns. It’s the way City Hall does business. City taxpayers are always happy to pay more taxes to help support Golfers. It’s a Norwalk tradition. I thought having a bar was going to solve all of the restaurant’s problems and it would be able to survive on it’s own two feet? @Byran I’m in no way insinuating that we should close Oak Hills. You state it’s in great shape but why is that ? because they’re spending money they don’t have! now a $200,000 line of credit plus another $83,000 from us the tax payers! Can you justify the moving of the pro shop up to the restaurant? Isn’t $100,000 rent better than 0? Norwalk needed a catering facility which was paying them a fair rent all while servicing the golfers and the public alike. This self centered group has made it a private country club on the taxpayers back. They will never pay this interest FREE loan off because of their overspending habits but keep convincing the financial mavens in the city to just keep kicking the can down the road! Hmm how can this not be on the agenda? Back room deals ? Is the Authority running the place or do they hire people to run it? For the amount of work that the volunteers put into this, they could work another job and afford to join any area country club. Good ideas for better management should come forth from the process. Get involved, give your resume to your local party or the mayor with a letter of intent. We need more dedicated volunteers and fewer keyboard warriors. Oh Sandra, Sandra, Sandra how little you know. How does the $200k LOC factor into this? The city has nothing to do with that. Oak Hills had to go get that on their own. And where is there proof that the building generated $100k in rent? The original vendor bailed when he couldn’t make a go of it and the next two jokers had to keep asking for rent reductions until deciding to stop paying rent and squatted for months. I applaud this authority for finally sticking up for the park. As the Mayor said in the article, “the City while recognizing the fact that a lot of the issues creating the current situation were issues that happened 15-18 years ago, and it really was a difficult situation for them (Oak Hills) to continue to operate under those conditions”. Oak Hills will survive in spite of an uneducated public who don’t really get involved to solve anything in this city. We only complain and let others do the work. Well, well, well, here we are again with the OHPA asking for a handout from the taxpayers of Norwalk and the restructuring of a defunct loan. @Roger, the $200k line of credit does factor into this because the OHPA has made $0 in obligation payments to the Norwalk Taxpayers over the last 2 years and is still $200k in the hole! What part of that do you not understand? $0 in payments toward the loan that paid for the construction of the restaurant and still in the red with their financials so this means the Restaurant or “Albatross” as @Bryan calls it does not factor into the equation at all! They made no payments towards the loan and collected no rent, it’s like it wasn’t even there, so how can you blame the building? And yes, go back and look at what the OHPA was collecting in rent for the first 5+ years on the building it was right around $100k per year, now $0 because the building was made smaller and the new “welcome center” greets the golfers better. I would much rather not be greeted as well and have my taxes not go up! It’s called overspending!! Can you imagine if every department of the City of Norwalk was to have free reign of their spending as the OHPA does? They would not have to go through the purchasing ordinance procedures just like the OHPA does not, purchase the BEST of everything just like the OHPA does, pay the employees anything they wanted to which the OHPA also does and then ask for funds when they ran out which the OHPA has done numerous times in the last 10 years! Actually our taxes would probably be only slightly higher then the ridiculous amounts they are now! IT’S TIME OUR CITY OFFICIALS WAKE UP ABOUT OAK HILLS AND PUT THE PARK BACK UNDER THE CITY OPERATIONS at least the spending will be controlled. ENOUGH IS ENOUGH time to abolish the OHPA. How can anyone possibly think they are doing a good job? I guess they may be doing a lot of pointless work, but what good is it when they will start the golf season probably a quarter of a million dollars + in debt AND NEVER BE ABLE TO PAY THE TAXPAYERS BACK FOR THEIR GOLFING FUN. I want to know *TWO* things. 2) Which of the commissioners are going to make *ME* whole for their arrogance, hubris and gross mismanagement? Also if any of my fellow Norwalkers wants to join me in a class action suit against OHPA, City Hall’s high taxes, & the idiots in government, who were and are still responsible for this and other insults, please like and share this with everyone. Hmmm, Bill . . . I don’t get it. You make it sound like the OHPA is a City Department. It is not. Parks and Rec ran the course at one time long ago and they drove it into the ground. That’s why the authority was formed. It just wasn’t set up with the proper financial foundation at the start. You make it sound like taxpayer money is supporting the course. It is not. The $83k they are getting is for saving a city building that was about to be destroyed last year in an auction of every asset in the (city) building. That $83k came out of their LOC. They are simply being reimbursed for saving, what would have been a WHOLE lot more to replace. And, furthermore, there is no Bill McFarland in the city tax records. Who are you really? The Oak Hills Golf Authority has received millions of dollars in taxpayers’ loans that have been turned into grants. In addition, recently it received a 1.5-million-dollar grant for taxpayers to cover its capital costs. “Golf courses around America continue to close.” http://www.golfadvisor.com/articles/10-warning-signs-your-favorite-golf-course-might-be-closing But not here in Norwalk thanks to special interest politics. “According to one study by the golf industry group Pellucid Corp., the number of regular golfers fell from 30 to 20.9 million between 2002 and 2016. Ratings are down, equipment sales are lagging, and the number of rounds played annually has fallen.” https://www.citylab.com/environment/2018/06/the-next-housing-battleground-dead-golf-courses/561896/ Nevertheless, here in Norwalk thanks to special interest politics tax payers keep paying so golfers keep playing. “And there are so many troubling questions to ask. Even in the best of times, are golf courses the kind of thing taxpayers should be subsidizing? And what about the privately owned, (and taxpaying), courses? Should the government be competing with them directly? What more essential city services suffer when more money has to be diverted to prop up a public golf course? And finally, are public courses really a boost to the middle class when the price of playing the sport is still quite high wherever you decide to play?” https://www.cnbc.com/2015/06/10/municipal-golf-courses-still-squeezing-taxpayers.html But these questions are not being asked by our local wannabee electeds because they figure most taxpayers aren’t paying attention while the Oak Hills Park Authority acting as a lobby for golfers is nipping at their heels every day. In 1967 the State purchased the land in what is now Oak Hills Park and granted it to the city “for conservation, recreational and open space purposes” with the stipulation that the land “not be conveyed to any use other than recreational or conservation purposes.” Then a 1999 master plan for Oak Hills called for “wider uses for the park.” Indeed, years ago it was recognized that if there is one thing Norwalk sorely lacked it was a public park near the heart of its city – a park like Wavenly Park in New Canaan. In Wavenly there are ball fields, picnic areas, jogging trails, platform tennis courts, a swimming pool, picnic areas, a dog park and even a practice area for golfers. In Oak Hills there is a sign that says: “No biking, walking, jogging.” ¬¬What happened to our park? It turned into a taxpayer subsidized money losing environmentally destructive 18-hole-golf course. The OHPA lobbied hard to get the city to tear down the restaurant that was already in the park and construct the one that is there now on the grounds that it would end up enabling it to cover its cost of operating and maintaining the golf course. Yes, mismanagement and a decline in the number of people who play golf. Yes, putting the pro-shop in the restaurant building might have made the pro happy but it clearly will do nothing to help the OHPA find a restauranteur willing to lease the building for enough to cover the difference between the cost of operating and maintaining the golf course and user fees charged to golfers. @ Bryan Meek and Paul Passarelli @Mitch Adis. “PUT THE PARK BACK UNDER THE CITY OPERATIONS.” “Turn Oak Hills into a park and call it a day.” Right on! The Authority was set up by GOLFER friends of the Norwalk politicians who didn’t like the way the golf course looked, wasn’t in tip top shape like their own private country club, and they thought they could do a better job then the Parks and Rec Department, similar to your statement of “drove it into the ground”. Although revenues from the users pay for operations and no taxpayer dollars are used in the daily operations, how about the $2M+ dollars that the TAXPAYERS OF NORWALK loaned (now gave) to the OHPA? or the $1.5M in State of CT money used to make the golf course better (instead of using it for infrastructure) by the STATE OF CT TAXPAYERS? So Roger, is taxpayer money being used to support Oak Hills Golf Course? I would still say YES, at least until ALL the funds borrowed (given) to the OHPA are paid back to the taxpayers.. Is the OHPA a department of the City of Norwalk? I would still say YES to that also. As far as the Parks and Rec Department running the park into the ground, they used the funds from the golfers who utilized it to operate it and no more, you may not have liked the way it looked but it didn’t run in the red as it is run now. The park was operated within its means. And, I am William J McFarland who has lived in Norwalk many years, just because I choose to have the deed of my house in my wifes name doesn’t mean I don’t pay a lot of taxes to the City of Norwalk and the State of Connecticut BOTH who have used my money to make Oak Hills Golf Course better for the GOLFERS of Norwalk and the surrounding areas. But, I am glad to see that my points have obviously made it through to you as you took the time to look me up on the City records! You still don’t get it Billy Boy. The $2M+ dollar loan that the city gave Oak Hills is STILL getting paid back to the city. It is just the interest that will be forgiven. Taxpayers break even. As for the $1.5M state grant, it could NOT be used on anything that was not specifically outlined in the approved 2014 Master Plan. And it did not just go into the golf course. It created open space in the Great Lawn and refurbished the Fountain Garden and the walking trails. I’ll bet you don’t even know that there is also Tennis at Oak Hills. If you want to complain about something, why don’t you question the $61M the city has sitting in a “rainy day” fund. Releasing some of that could help your taxes. Paul would love to see a class action suit,so tired of my hard earned $$$$ going to oak hills,wall street failure and the mayors new reorganization gimmick. how do we get together with you??? I have to disagree Roger Dodger, you are the one who really doesn’t get it. the $2M taxpayer dollars will never be paid back because the OHPA will NEVER have enough funds. And even if somehow miraculously they do begin pay it back its amortized over what like 45 years on items like an irrigation system who’s lifespan if probably no more then 25 years? And what happens when some major capital expenditure happens prior to that like a new multi million dollar irrigation system? I’m sure you Roger will be driving the OHPA members personally down to City Hall to ask(beg)for more taxpayer funds! As far as the so called “master plan” am I incorrect in saying it was the OHPA who hired the firm to do the master plan and worked with that company as to what they thought should be in there? if not then whoever did the master plan without including any infrastructure improvements should be out of business by now. Wasn’t it Total Driving Range Solutions? funny I can’t seem to find there website anymore. Okay Roger now go ahead and tell me I’m wrong…I can do this all day to keep this in the headlines. Myška, my wife, and I figure on attending the Common Council’s meeting (tomorrow, Wednesday, February 13, 7:30 at City Hall) to weigh in on the plan to restructure the loan agreement with the OHPA. Our hope is that you and others will join us to oppose again restructuring the OHPA’s loans and to oppose the lack of transparency regarding how the decision was made to do so. A key question that needs to be addressed is: What is the reason the public has not been given the opportunity to weigh in on the issue before it is being brought up for a vote? Apparently, our elected officials engaged in back door negotiations with the OHPA over an extended period of time. That is not the way our elected representatives should behave. And the fact that they did so is shameful. Again, it is a classic case of reprehensible special interest politics. At the meeting we’ll happily provide our contact information to anyone who wants to join the effort to turn Oak Hills into what it was originally intended to be: a public park that serves the interest of all the taxpayers of Norwalk and not just a special interest group of golfers represented by the OHPA. A good solution for the future I’ve thought about for years is reducing Oak Hills from 18 to 9 holes as many other municipalities around the country are doing (see link below), which drastically cuts maintenance costs including mowing, fertilizer and pesticide use, and water usage in half, and actually may draw in more golfers as fewer golfers have the time or money anymore for a 4-hour commitment for 18 holes. If you want to play 18 holes you just go around twice. By cutting maintenance costs in half, OHPA can finally sustain themselves independent of taxpayers, and the other 9 holes can become nature trails and birdwatching platforms in restored upland meadows for endangered ground-nesting songbirds, encouraging nature education from local schools. If public demand justifies it, maybe even a new grass soccer field or two, and/or a motocross bike course. Oops, I meant to say a “mountain bike” course, not motocross, in my last comment, as just one of the recreational options that can easily fit on the real estate of the 9 holes in a conversion from 18 holes to 9 holes. As in non-motorized. Motocross would be too loud for the Oak Hills neighborhood! And this would be in addition to restored habitat for birdwatching and nature trails that would still make up the majority of the leftover land, in my suggested sustainability plan for Oak Hills. Mike the man of expertise on all things – how many rounds did you play in 2018? Do you have a USGA handicap? Just asking questions. Thanks everyone !!!!! You woke Paul Cantor up !!! Yes indeed. Anyone want to help out with local journalism? Millennials don’t play golf. At least not nearly much as boomers did. @Patrick Cooper, thank you for recognizing my talent, although I’m not an expert on everything as you so kindly suggested, because no one knows as much as our president! Since you asked, I don’t golf, unless you include mini-golf which I love to do every chance I get. The Calf Pasture course is a real challenge, especially after a couple of beers! But I was trained in golf course design as part of my 4-year education at Rutgers when I got my Bachelor of Landscape Architecture ( now licensed in CT, NY, and NJ.) Golf course design is a big part of our profession. However, the last thing I want to do on my day off is walk around another manicured landscape, or in other words a classic busman’s holiday. And theres plenty more where that came from if you need a deeper dive into the subject. Instead of turning Oaks into a 9 hole golf course, you’d be better off packing every last square inch of it with more cheaply built apartments. Mountain bikes are already welcome at Cranbury Park. Should we turn half of the beach into a shooting range?